The new Parliamentary Education Centre – opened in February 2015 – sits on the edge of Victoria Tower Gardens in London and sports a green wall and green roof. Designed by Feilden & Mawson, it achieved a Breeam Excellent, and contains five separate spaces where children can learn about the history of British democracy, citizenship and politics. 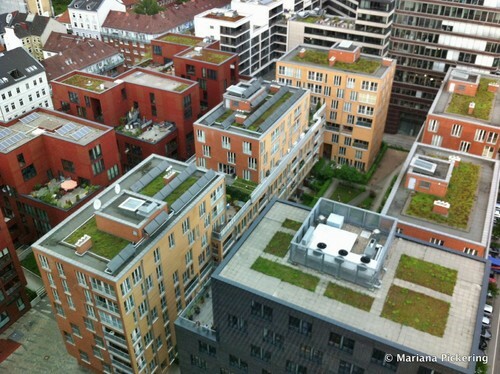 Good article here by Lee Evans, Director of Organic Roofs, on why so many Sedum green roofs struggle. Unfortunately the many Sedum green roofs in Brighton are struggling too – for example those on Council buildings such as Whitehawk Children’s Centre and library, private buildings like the Smart House on Ditchling Road and the American Express HQ in Kemptown, and schools like Downs Junior. The good news is that any struggling green roof can often be given a whole new lease of life by adding additional substrate, and establishing some more suitable plants. Better still to get it right first time!